Lately I've been crushing on some army green items such as this wax jean from Cimarron. This color is quite nice for the winter time and is the perfect alternative to black ! But sometime this color can appear to be a bit masculine, so mixing it with a lace top is my way of keeping a feminine touch. To add even more feminity into my look I could have put on some cute heels, but I wanted to wear something more comfy. 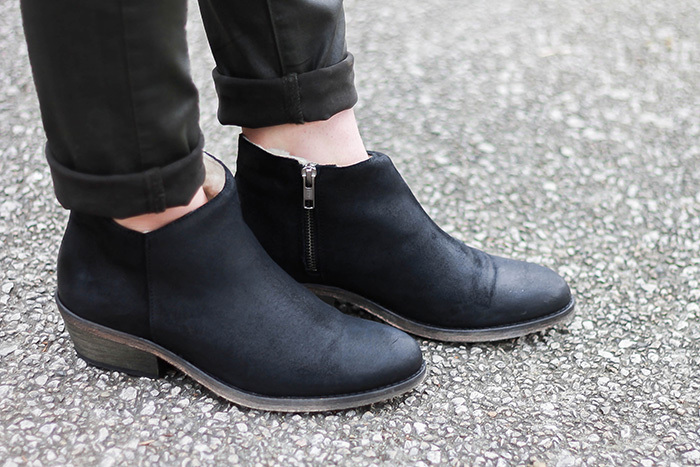 These lovely pair of Tatoosh lined ankle boots seems to be the ideal choice to keep me warm all day long. If you guys are interested in getting lined boots to keep you warm MysShoesDesign offers you a 20% discount on those one with the code : HOG, pretty nice, right ? This lace top looks lovely on you and I love that you added a vest. Such a pretty outfit! Super look surtout le jeu avec la dentelle !